If you’re looking to buy a Xbox One gaming console or Video Games for Xbox One then you are in the right place to find the best sales & deals, including coupons & promo codes from Microsoft or other major retailers. Browse the current discounts & clearance sales for Xbox One gaming console or games. Find amazing sales and use printable or digital coupons, to pay the lowest price on your new Xbox One console or games. Xbox is a gaming console manufactured by Microsoft. – Get up to $50 OFF when you buy any Xbox one S bundle. – Free $30 credit – Buy an Xbox One X and get $30 in Microsoft Store credit that can be used toward the latest Fortnite Battle Pass. – Starting at $229 + free game – Buy select Xbox One S consoles and get a free select game of your choice. – Xbox Game Pass – Play new Xbox One exclusives and over 100 other great games for only $9.99 per month. – Get 10% OFF Your Order. Use Promo Code: ashwnsday14. Valid until 05/31/18. – Starting at $199.00 (Save up to $50.00) – Xbox One S Console – Forza Horizon 3 Bundles + Free Select Game. Bundle includes: Xbox One S 500GB or 1TB Xbox One S consoles, Xbox Wireless Controller, Forza Horizon 3 Standard Edition disc, 4K Ultra HD Blu-ray, 4K video streaming, High Dynamic Range, premium audio, 14-day Xbox Live Gold trial. – $299.99 Xbox One S 1TB Minecraft Limited Edition Bundle. Get the Xbox One S Minecraft Limited Edition Bundle (1TB), featuring the first-ever Minecraft custom Xbox console with grass block and redstone design, iconic green Creeper controller, Minecraft system sounds, and a vertical stand. Xbox One S has 4K Ultra HD Blu-ray, 4K video streaming, and High Dynamic Range. – Free 2-day shipping on eligible items with $35+ orders. – Save $50 on an Xbox One S console. Enjoy 4K Ultra HD, 4K video streaming, and access to more than 1,300 games with this console. – Save $20 on a select Enhanced game with Xbox One X. When you buy an Xbox One X console, you can save $20 on a select Xbox One X Enhanced game of your choice. – $249.99 Microsoft – Xbox One S 1TB PLAYERUNKNOWN’S BATTLEGROUNDS Bundle with 4K Ultra HD Blu-ray. 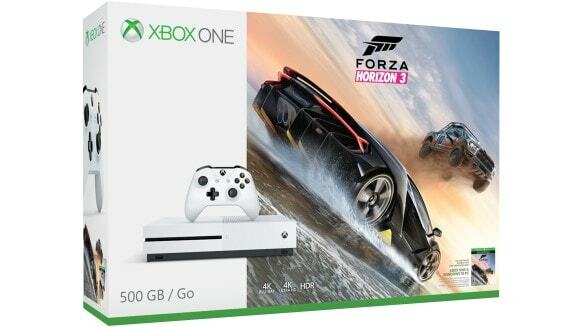 – $229 Microsoft Xbox One S 500GB Forza Horizon 3 Hot Wheels Bundle. – $249 Microsoft Xbox One S 1TB Rocket League Bundle. – Save $20 on up to two Xbox One enhanced games, with anynew Xbox One X console. – Free Xbox Wireless Controller when you trade any system toward the purchase of a new Xbox One X. – $249 for Xbox One S bundles. – Free Shipping on orders over $35. – Buy an Xbox One X console and save $20 on an enhanced game. – $327.96 Xbox One 1TB Console – EA Sports Madden NFL 16 Bundle. – $279.99 Xbox One S 500GB Starter Bundle. Included game pass offers endless play options, including discounts on Xbox One games. Xbox One wireless controller. 3-month game pass access code. 3-month Xbox Live Gold access code. – $299.99 Xbox One S 1TB Minecraft Limited Edition Bundle. Brilliant 4K Ultra HD Blu-ray and video resolution delivers the clearest, most realistic video possible. Featuring a full-game download of Minecraft plus the Redstone Pack, a collection of unique skin packs. Play console exclusives like Forza Motorsport 7, Crackdown 3, and State of Decay 2, plus blockbusters like FIFA 18, Middle-earth: Shadow of War and Madden NFL 18. – Earn Kohl’s Cash – From 12am (CDT) May 10 to 11:59pm (CDT) May 20, everyone gets $10 Kohl’s Cash® for every $50 spent in store.